Boro turned the heat on Derby and powered on through to victory. After a hugely impressive display we are in pole position for a play off finish with only two games remaining. Boro seem to be hitting our best form of the season just at the right time. The sun was blazing in Derby and temperatures were soaring. Boro would make it extremely uncomfortable for the home side from the start. The red of the away section stood out as it filled before kick off. That big and noisy travelling support had plenty to sing and chant about and never stopped from before the game until after the end. It would be an almost perfect away day and certainly a memory to savour. Patrick Bamford's crash landing meant they would not be able to take part instead it would be Britt Assombalonga aiming for a scoring return to the East Midlands. Adam Clayton's heroics against Sheff U and Bristol City meant he was preferred to skipper Grant Leadbitter to be the midfield warrior. Otherwise Tony Pulis once again picked the same team. The manager was looking for consistency and reward for his careful preparation this week. David Nugent took the applause of the Boro corner before the kick off. Such a good worker for the Boro cause, he really should never have been sold so quickly and he was to toil tirelessly for Derby in this contest. Adam Clayton was shown a booking almost from kick off. It seemed harsh to caution the very first foul and that was underlined when Adama Traore was blocked off and chopped down on a couple of occasions. Indeed Ben Gibson protested loudly at the rough house tactics against the winger, many of those offences went completely unpunished. No protection then for talent. The only way to punish the opponents was for Traore to carve them open, something he did for both goals. The atmosphere was red and white hot, I saw kids with ear plugs in and no wonder it was so loud that it made your ears pop. Out on the pitch things were just as ferociously competitive. There was more than a hint of desperation to Derby's play. They were only too keenly aware that they were in danger of bottling promotion for the umpteenth season in a row. Derby put a header past the post but Boro looked far stronger in midfield. In spite of his booking Clayton was taking control with Howson and Besic looking to spring forward at every opportunity. Downing and Friend down one side and Shotton and Traore were posing a real threat down their flanks but also covering back in a really disciplined fashion. Britt was putting in a shift battling away with the Rams defence. Traore had already beaten their defence on a couple of occasions before breaking through and past his marker for the goal move. His centre was only cleared as far as Besic who was allowed time to cut inside and hammer home a shot too hot for Carson to handle. GOAL! 1-0. That could such an important goal not just for this match but also for the remainder of the season. It will give Besic the confidence when he is forward positions. He now knows he can shoot and score. That could make such a difference. Mo.. Mo.. Mo .. Mo (sung to No Limits) was the theme tune to much of the remainder of the first half. Boro went in at half time to an ovation from the away end. Could we hold this score line for the last 45 minutes? After Millwall's defeat, to beat Derby would put us in such a strong position running into the final couple of games. Boro continued to be strong through the middle of the park in the second period. We were largely restricting Derby to long shots and Randolph had the saves in his armoury to cope. The keeper was also positive in coming for catches when Derby did make crosses. Boro hit a purple patch where we could and probably should have scored again. Traore powered past three players before crashing across a centre that just evaded Britt at the far post. Just too much pace. Howson cut inside a struck a superb dipping shot that rattled the crossbar. Minutes later and Howson and Besic latched onto the same ball, Besic took charge and powered a shot narrowly wide. He was left head in hands. Would that be an important miss? No, Traore was left free in the box, he steadied himself advanced and then found Britt totally unmarked at the far post. The former Forest centre forward took great delight in taking his time before crashing home. 2-0. Cue the Britt Assombalonga song from the away end. After an E-I-O. Then there were lots of We Are Middlesbrough and even more Tony Pulis – Red and White Army. There was even a wave from the manager at the request of that red and white, all singing and dancing corner. Derby threw on the subs and threw men forward but Gibson, Ayala and co. were standing firm. Meanwhile the clock was ticking down, far too small on the big screen at the opposite end of the stadium, where all the writing was an opticians test. The old school digital scoreboard at our end was at a difficult angle and so hard to see. But we could see well enough that there was little time left for the home team. 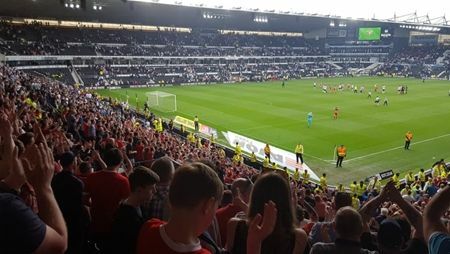 “It's happening again,” Boro fans taunted the Derby crowd and players. And it does look as if they are once more slipping out of the play off places just as the heat is on. Deep into time added on the Rams got a lifeline with what appeared to be a harsh penalty after Ayala and a Derby player collapsed to the deck at a corner. For the spot kick, even after Randolph was told which way to dive, Nugent did not miss. Thankfully there were only seconds remaining to be played. Phew. Boro had won. Cheers for the players.. “it's happening again,” chants to Derby and then incredibly news spread that Sunderland had gone down. Surreal. Boro fans exited the away end wearing broad smiles and singing away in delight. A steward stopped me. “Do you know where you are going?” “See you next season.” Am going towards the play offs (unlike you). Hopefully I will not be back next time.